Your Province Delivered. Subscribe today and you will receive access to all our e-Edition newspapers on the map below. The most convenient and cost-effective way to receive your news! Your News. Your Way. Ready when you are. Subscribe and get access to ALL SaltWire Network Newfoundland and Labrador publications every day. 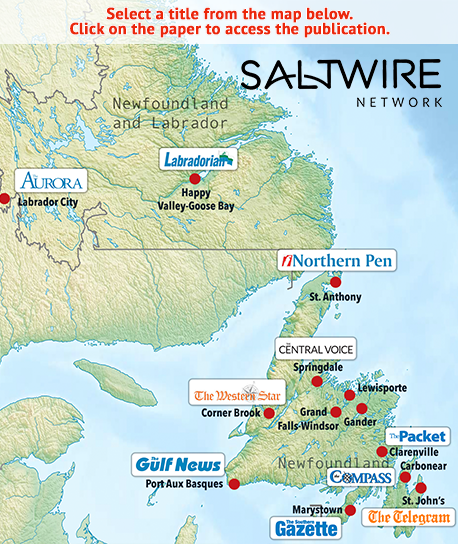 Choose how you want to experience SaltWire Network Newfoundland and Labrador publications. You can upgrade or cancel any time. SaltWire Network Newfoundland and Labrador E-Editions are full of interactive features to engage and delight news lovers. Familiarize yourself with each one of them and enjoy the benefits of an enhanced news consuming experience. On-demand narration is a great feature for users who like to listen to their newspapers while multitasking or who are visually impaired. Download your digital edition on a mobile device and read it anywhere. Our new tool offers instant translation in multiple languages for most articles. Read stories in your news feed on one device and pick up where you left off on another. Subscribe and authorize up to five devices with one account. If you’re already an user of one of our windows apps: don’t forget to uninstall your current app before installing the new one. All rights reserved © 2017 SaltWire Network.